The simple cardboard backing makes me wonder if this is a draft copy. I keep thinking that woman looks like the corset is squeezing her body out the top of her head like a tube of toothpaste. I’m intrigued by the unfussy, almost modern (to my mind) way the drape rather neatly bisects the image, and the way the flowery pattern is backing the man. Not that he looks happy about it. Not that he looks like he’d be happy about much of anything. Ha! ‘Squeezing like toothpaste’. Classic. She looks like an alien (outer space kind) to me. LOL, yes, he looks a bit trapped. 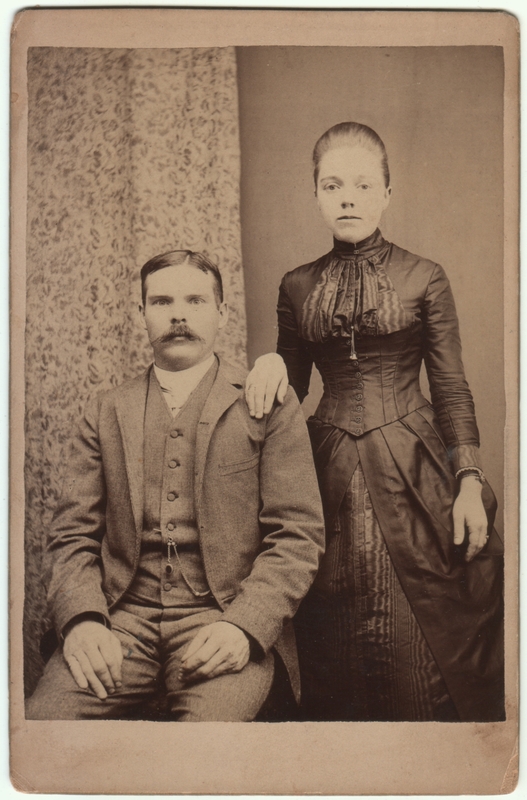 This looks like an 1880s image to me although I can’t see much of the dress. Let me just assure you that if you have any 19th century woman in a photograph, she will be wearing a corset. Even the lower classes emulated high fashion. Clothing was cut to fit over a corset and bodices might even have a bit of boning in them to help maintain the shape. She has probably been wearing a corset of some kind since age 8 or 10. Neither looks happy – or comfortable! I think her head is going to pop. I know! I worry for her. I think they’re both holding their breath. The woman reminds me a bit of Sissy Spacek. They may well be holding their breaths. And yeah, I can totally see Sissy Spacek playing her in the movie of their lives. Yes, they look like they’re very ready to be done with the experience. Looks to me as though they’re quite young and quite scared. Engagement? Been married for years even at their relatively young age? She looks so miserable behind a mask of “well, this is my lot in life.” And he looks miserable, too. Ah, Nineteenth Century. You were good, good times. No wonder the laudanum epidemic. Yes, I know it’s too easy (and a little too fun) to assume that the expressions and poses in photos represent the larger contexts of their lives, but without additional information about them it’s hard to think much else. Thanks for the link. Whenever I see Victorian photography portrayed in a movie or TV show, the flash is always astonishingly bright.